Perception Sales and Marketing love a traditional Hogmanay and this year The Isle of Eriska has a packed programme for the festive and New Year season. The Isle of Eriska, Hotel, Spa and Island invites old friends and new guests to experience a traditional Scottish Country House Christmas and fun-filled Hogmanay with two sparkling seasonal packages. Located just two hours north of Glasgow, the five-star Isle of Eriska is part of the prestigious Inverlochy Castle Management Company (ICMI) portfolio. Named the Hotel Management Company of the Year at the 2017 Scottish Hotel Awards, the ICMI family boasts some of Scotland’s best known small luxury hotels, including Inverlochy Castle, Cromlix, Greywalls and Crossbasket Castle. The 300-acre luxury private island is an oasis of peace and tranquillity and a veritable winter wonderland, offering breath-taking views of Loch Creran and the rugged Highlands. 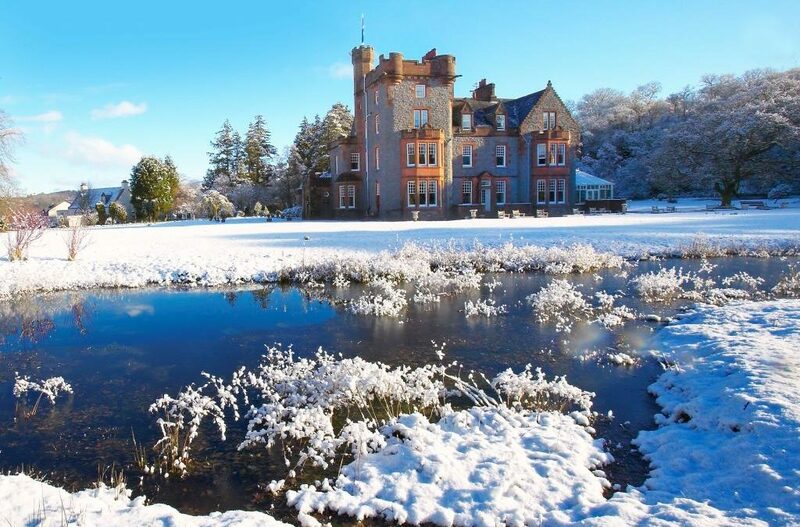 With a packed schedule of Christmas festivities planned from 23rd to 27th December and five days of New Year celebrations from 29th December through to 2nd January 2018, Eriska has something for everyone this season. These seasonal getaways offer ample opportunity to relax on the beautiful estate and include a range of festive activities such as a traditional Christmas service at the local church, a black-tie dinner; a special New Year treasure hunt and a Ceilidh. Christmas Day begins with a relaxed champagne breakfast, followed by light lunch and an optional carol service at the local church. The day ends with a sumptuous black-tie Christmas dinner, created by Conor Toomey in the hotel’s gourmet restaurant. Guests can welcome 2018 in true Scottish style with a Ceilidh and a spectacular Hogmanay firework display over the sea. A series of optional activities will take place over the New Year period, including the annual Eriska treasure hunt, Highland Games and the first Open Golf Championship of the year on the resort’s stunning nine-hole course. For those wanting to return to the dance floor, the inimitable Paddy Shaw and his Scottish Country Dance Band will be entertaining guests in the Drawing Room on New Year’s Day. Famed for its locally-sourced food, guests can indulge in beautifully prepared, exclusive menus, designed by Head Chef, Conor Toomey. Fish is sourced from the surrounding waters, meat from the nearby hills and game is supplied by a variety of local gamekeepers. Inspired vegetarian alternatives drawn from the hotel’s gardens and larders are always available. Those looking for a spot of pampering can retreat to the Stables Spa for a relaxing ESPA or Ishga treatment, or blow away the winter cobwebs with a stroll on the island’s wonderfully unspoiled beach. Eriska is home to an abundance of natural wildlife including otters, red deer and golden eagles, many of which can be spotted on the resort’s walking trails. The resort is dog-friendly and actively encourages four-legged friends. The four-night Christmas Package starts from £1110 per person, based on two people sharing. The five-night Hogmanay & New Year Package is priced from £1345 per person, based on two people sharing. The resort also offers limited Christmas Day and New Year’s dining opportunities in the more informal setting of The Deck Restaurant. Pre-booking is essential. For press enquiries please contact Perception Sales & Marketing Limited. The Isle of Eriska is a luxury five-star resort, located on its own 300-acre private island. Facilities include a 9-hole golf course; indoor sports hall with tennis courts; croquet lawn; gourmet restaurant; Deck Restaurant with stunning sea views; and the Stables Spa. The hotel is a member of Luxury Scotland. With a 3AA Rosettes, Head Chef Conor Toomey offers an exquisite dining experience with a four-course dinner menu, tasting menu, an impressive wine list and famous Farmhouse Cheese Trolley with 40 varieties. The island is 5 miles from Oban Airport and a two-hour drive from Glasgow airport. It is also 6 miles from Connel Ferry Train Station. Christmas prices start at £1,110 per person and New Year’s Eve at £1345 – based on two people sharing. The rates are inclusive of all dinner, breakfast, lunch, morning coffee, afternoon tea, Christmas Package programme or Hogmanay Package programme, use of leisure facilities and VAT.